nationalantsonalogday | Live Cheap, Feel Rich! Yes – that’s a national day! Hope everyone had an incredible Labor Day weekend. Mine was spent upstate in the Adirondacks fully relaxing, barbecuing, and – early for the season – apple picking! Stay tuned later today for what I plan on making tonight with my apple bounty! Before I delve into that, I saw that today was #NationalAntsOnALogDay – that’s certainly a mouthful – but I couldn’t pass up the opportunity to talk to you about a snack near and dear to my heart since it was something I ate as a child and now serve up to my kids all the time as a fun, easy, healthy snack. Let’s break down the original recipe, firstly. 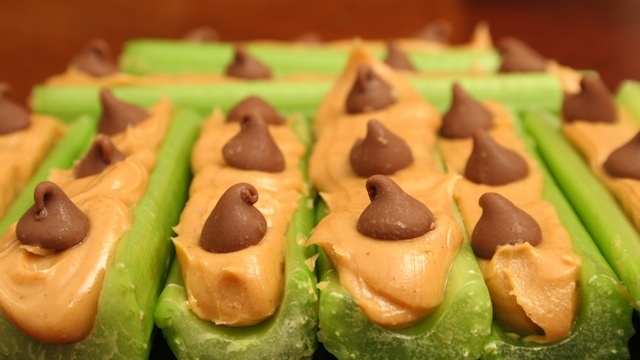 A classic ants on a log is a stalk of celery, filled with peanut butter of your choice, and topped with raisins. So easy – so fun. However, I had this creeping feeling that ants on a log are even MORE fun these days, and I knew that Pinterest would have some crazy variations for me to try with my kids this week – especially with the onset of packing school lunches again! I found some super fun recipes and had to share with all of you! All of these recipes are equally as simple, healthy, and quick. Enjoy! As if this name isn’t already fun enough…I love this! 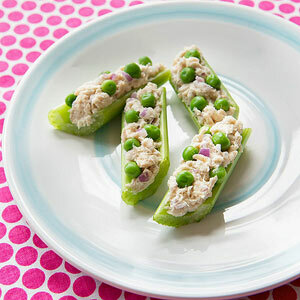 Tuna canoes are simple – fill celery sections with your favorite tuna salad. Top with thawed frozen peas! This is a great, filling, high-protein option. A lot of kids aren’t into raisins – no biggie! Switch them out with chocolate chips (or pieces of cereal, or granola bites, or craisins, or dried cherries…you get the jist). Really what this comes down to is tweaking this fun snack to make it suitable for anyone. Hey – don’t like peanut butter? Try almond butter! Variation is key. 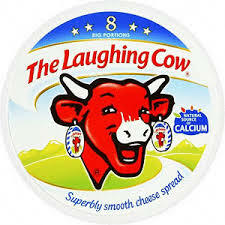 If you haven’t discovered the joy of Laughing Cow Cheeses yet – get on board! They are individually wrapped triangles of spreadable cheese – they’re low cal + healthy + come in a TON of fun flavors that blend awesomely with a sweet or savory treat. Trusper.com uses it for several variations of ants on a log – Laughing Cow + Salsa, Laughing Cow + chopped apples. Give it a taste and play around! Last Minute DIY Costumes for Kids!